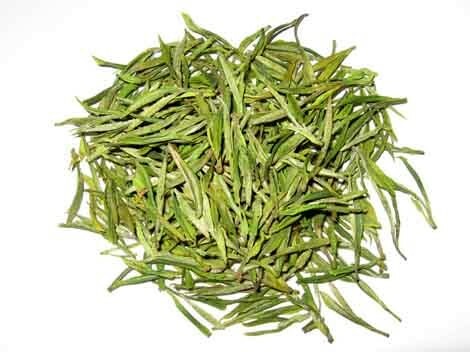 Lushan Cloud-fog Tea is a sort of top-quality green tea produced in Lushan Mountain, Jiangxi Province. It is named after the production place. Lushan Mountain is featured by high altitude, great seasonal temperature difference, strong irradiation of ultraviolet, could and mist suffusion in half a year, and murmuring spring. This environment offers advantageous growing conditions for tea trees and facilitates the compounding of aromatic substances in them, thus contributing to the top quality of Lushan Cloud-fog Tea. Made of tender shoots, Lushan Cloud-fog Tea is characterized by elegant and prominent appearance, unveiled silver pekoe, jade green color and luster, lingering fragrance, fresh and sweet savor, as well as long-lasting aftertaste. The liquor is abundant in tea polyphenol, leaf extract and long-lasting intense fragrance, with the content of tea alkaloid and vitamin C higher than that of common types of tea. It is said that monks living on the Lushan Mountain began to plant tea trees on the mountain early in the Eastern Han Dynasty 1800 years ago. The period around Qing Ming Festival is the high time for picking tea leaves, the raw material of Lushan Cloud-fog Tea. The most precious Lushan Cloud-fog Tea is “Mingqian Tea” which is made of tea leaves picked prior to the Qing Ming Festival when spring just comes back and the shoots are extremely tender. The picked shoots must be processed on the same day with multiple working procedures. One kilogram finished tea requires over 0.1 million tender shoots.